The BCCI on Monday announced the Indian squad for the upcoming ICC Cricket World Cup 2019 starting 30th May. The selection panel led by MSK Prasad, after its meeting in Mumbai, announced the 15-men squad for the World Cup. The much-awaited World Cup will take place in England and Wales from 30th May and will conclude on 14th July 2019. The deadline for the announcement of National team for the tournament was April 23 and the selection panel after considering the performance of few players in the ongoing Indian Premier League (PL) has announced the final squad for ICC's biggest event. The Indian team is considered among the favourites to lift the trophy in this edition of World Cup. There was a big question mark for the position of No. 4 batsman in the team. There were not many surprises in the team that was announced, however ignorance of few players by BCCI has come as a shocker. BCCI has shut its eyes on young Rishabh Pant for veteran wicket keeper Dinesh Karthik. Dinesh Karthik has been selected as a backup for MS Dhoni. Ambati Rayudu's ignorance for the World Cup has shattered his fans as his inclusion in the squad was confirmed by experts. This is how netizens have reacted for Ambati Rayudu and Rishabh Pant's exclusion from the World Cup squad. 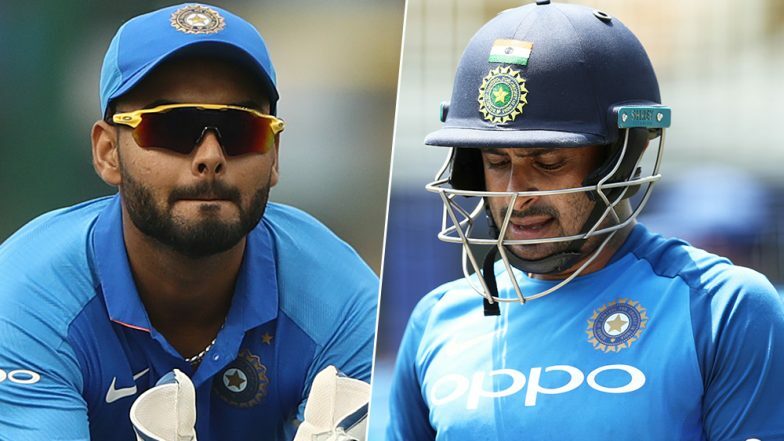 India Team for ICC Cricket World Cup 2019 Announcement Updates: Dinesh Karthik Included, No Place for Ambati Rayudu and Rishabh Pant. Rishabh pant after not getting selected in world cup squad. From being the first choice at no. 4 to being dropped from the squad. The Indian team for the Cricket World Cup 2019 looks pretty much balanced with the inclusion of three fast bowlers Jasprit Bumrah, Mohammed Shami and Bhuvneshwar Kumar. The team also has four all-rounders Hardik Pandya, Vijay Shankar, Ravindra Jadeja and the giant killer Kedar Jadhav they can contribute with both bat and ball, while, the top order looks upright with Rohit Sharma, Shikhar Dhawan, Virat Kohli and KL Rahul. Moreover, MS Dhoni knows how to deal with the death overs!